In Weledi, a town located 330 km from the capital city of Addis Ababa, Bechtel experts in partnership with the local government, NGOs, and community; and Engineers Without Borders, worked together to strengthen the resilience of the community against future health hazards that arose from water contamination. The Ethiopian town of Weledi is a hub for thousands of people in the country’s northern highlands near Africa’s Great Rift Valley. With the only paved road for miles, it’s where people from throughout the region come for medicine and health care, school, and shopping. The region has seen a rapid increase in population due to a growing influx of workers from different communities seeking jobs in various infrastructure projects. This generated an additional 5,000 sellers and buyers in the central market. However, Weledi had limited to no public sanitation or disposal facilities or services, and a shortage of local capacities to build the required infrastructure. The lack of sanitation was compounded by weather extremes, such as heavy monsoons and extreme droughts that weakened the soil integrity and increased the reach and impact of water contamination and water-borne illness. Currently, 75 percent of Ethiopia’s health challenges are attributed to disease from unsafe water and poor sanitation. These environmental hazards, combined with malaria and poverty, gave the Weledi area a high mortality rate. 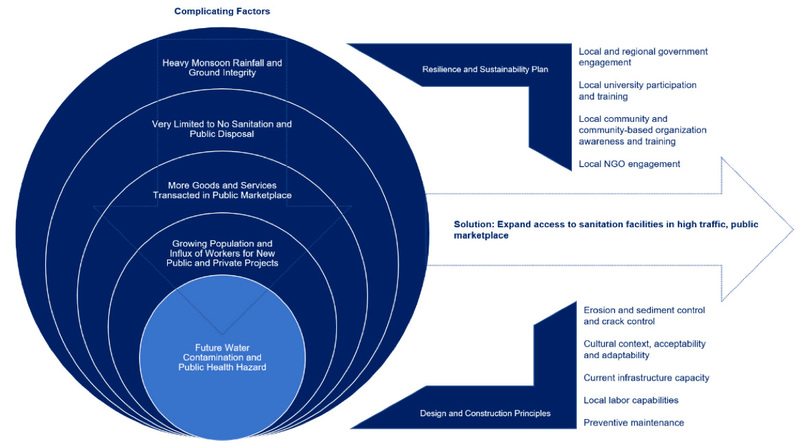 Based on local assessments and extensive stakeholder consultations, Bechtel and the team determined to expand access to sanitation facilities in the high traffic, public marketplace. The delivery plan combined resilience and sustainability and specific design and construction principles. The resilience and sustainability plan focused on stakeholder ownership of the project. For example, we partnered with local organizations and the city’s health department to promote education in the community. One such organization was Outreach Ethiopia, a local NGO that is helping spread the message to at-risk communities. To ensure this project benefitted the community beyond our time in Weledi, we identified local representatives who could continue sharing the educational component, and potentially extend this knowledge to other communities. Engineering students at the Wollo University in Kolmbocha Campus expressed interest in fulfilling this role and monitoring the sanitation infrastructure. These students are also working in partnership with engineering students from a U.S. university to exchange best practices and lessons learned. We hope this partnership can become a template for engagement with other communities as well. Control wind or water erosion and surface cracks that lead to open defecation and other unsanitary practices. Besides the environmental and health benefits, with the improved sanitation system, vendors can also open their shop for longer periods of time and potentially increase their income to support their families— generating a positive economic impact. This project impacts over 50,000 people and their families in the Weledi area.